Finally!! The third piece in my trio of freeform is done! I started this while I was working on my Choose Your Own Adventure pieces (which are in my previous post; a blog hop hosted by my lovely friends Mandi Ainsworth and Karen Williams), when I intended to have a trio of bracelets to reveal on the day, but I only managed to finish two of them - and this one decided it had to be a necklace instead. I have to listen to the beads when they yell at me that loudly. So more soup was mixed, and off I went. Here is Runestones. I am so happy with this necklace. It was a wonderful piece to work on, and looking at it now still makes me feel happy. I love the colors. I love the feel of it. Not just the feeling I get looking at it, but actually touching it - it's very textural and fun to stroke. The fringe on this one also lays just how I wanted it to; I used OneG to string the fringe and do the small bits of peyote, and it's very swingy and drapey. 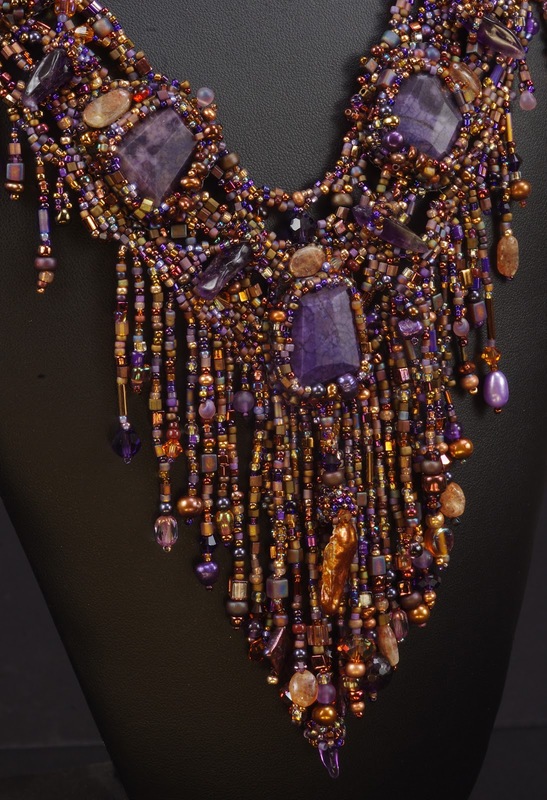 The center-most fringe is a peyote strip, which has a bezeled Amethyst claw at the end. Hanging from the focal stone is another center fringe which is tipped with a gorgeous copper freshwater pearl, also bezeled. 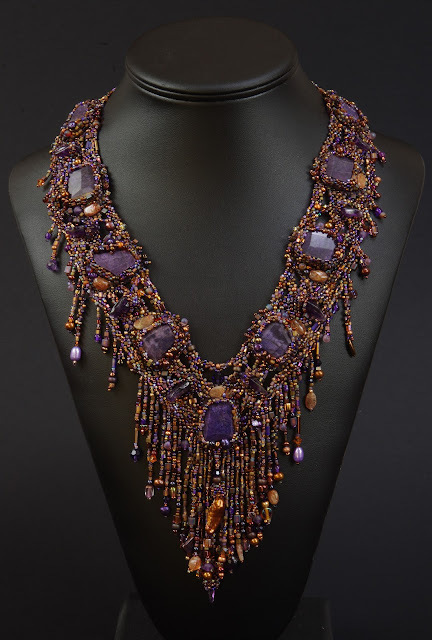 The main body of the necklace is made with freeform peyote stitch, which connects to each of the embroidered focal stones. The amethyst 'claws' are on top of the base, and woven to it with more strands of peyote. The clasp is hand fabricated copper from one of my favorite metal workers and was custom made for me. I tried it on (OF COURSE I tried it on!!!!) and it's magnificently comfy and wearable and feels yummy on the neck, with nothing poking in or sticking out (which I always worry about when I make fringe or 'spiky' edges). My Runestones necklace is made of a huge bead soup mix which includes the faceted Sugilite focals, the oval Sunstone beads (which have a glorious sparkly glitter-like matrix up close), amethyst 'claws', freshwater pearls, Swarovski crystals, copper metal beads, vintage and modern glass and every kind of seed bead I own. 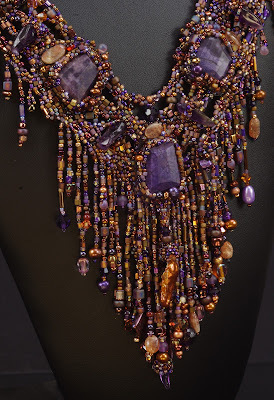 There are dagger beads, drops, Czech cathedral crystals, Swarovski and cubic zirconia drops, faceted AAAgrade Amethyst beads, bugles, cubes... on and on. I hunted and pecked and used anything that looked like it might be talismanic, or that looked like it belonged. UPDATE - Giveaway is closed now, 3/3/13 - Teddy will pick a winner in a few hours! :) :) :) Thank you, everyone who commented!!!!!!! S T U N N I N G.
Sure hope you pick me! I'm a huge fan! I LOVE THIS! I have no words for how much I love it!!! SO beautiful, Nancy!!! I love all your pieces but I have to say, this is my new favorite! A M A Z I N G!!!! I love your creations! I also really enjoyed reading about the fictional woman! PLease, write more stories ...I could actually see her at the desk with her leather journals! I am so happy to see all your beautiful artiful designs! This is gorgeous Nancy! I'd love to win your soup!! Gorgeous necklace and I loved reading your post! I am blown away by the finished project! The stash of beads we all saw at the hop became this magnificent beauty. Bohemian, gorgeous, exotic. And Fringe! Oh Nancy! As I was reading your description, I kept thinking it reminded me of so many of the characters from the books I read. I could see her so clearly wearing this beautiful creation! As an owner of your bead soup (I confess it sits in a prominent spot on my desk, so I can admire it...) I would be so thrilled to win this gorgeous soup! And thank you for sharing this awesome necklace. It is true inspiration! Beautiful, beautiful, beautiful, Nancy! I'd LOVE to have an opportunity to work with that wonderful soup! Nancy...you've gone over the top again ! Choose me...there's still fleets of snow in VT...I need color ! It is magnificent, I love it! and I love the story that goes with it, I can see that woman in this piece. Gorgeous Nancy! You are a Goddess with a needle, thread, and bead soup! The tones and textures of this designs is gorgeous, love the synergy and flow - beautifully done. It is a beautiful necklace. I love the coloring and the story that goes with it. You did an amazing job. I always use OneG for fringe it really drapes so well. This challenge was a real winner for you!!!!!!! Nancy, wow! What a gorgeous finished piece, and I love the image of the woman to go along with it. It just goes to show that jewelry art, like many other art forms, has its roots in storytelling. The stories that go with a piece are often as important as the aesthetics. Wonderful job, and gorgeous soup! Truly gorgeous and Nancy at the top of her form. I'd love to be in with a chance of more soup the colours are just so inspiring! Pick me please Teddy! your necklace is beautiful! it looks like it would feel good "on" the weight and the drape, I just love t! This is a stunning piece. I have never been courageous to make bead soup before, so using one already mixed by someone whose work I appreciate will make me feel less intimidated with bead soup; not that I would expect to produce an equally stunning piece though lol. Oh, for GORGEOUS! I'd love to see what would happen if I were able to work with that bead soup...! 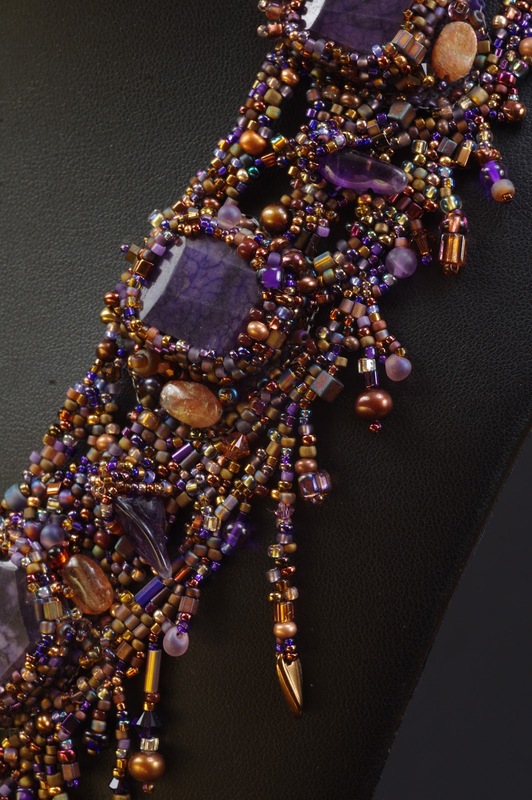 Another fantastic piece Nancy your work just flows, and your bead soups are superb. You are truly inspirational. Your work is amazing and I love your pieces. This is incredible Nancy and such a wonderful blog too! These are some of my favourite colours too so I would absolutely love to win your soup! Congratulations on this beautiful work of art! Thank you so so so so much!!!!!!! I'm so pleased that you all like her so much!!! You have a wonderful way with words and an even more wonderful way with beads! I'd love to have half your talent. Please, keep 'em coming! My very favorite colors to worth with. It's gorgeous, Nancy. I hope Teddy can smell my dogs on my post, and picks me! LOL! Facebook friend and frustrated logger-inner - BAH! This is fabulous. I totally adore your inspiration, it makes me walk with you in a strange fantasyland... thank you for sharing with us, it is wonderful, amazing. Totally bewitching. Stunning, I love your colour choices and the design. 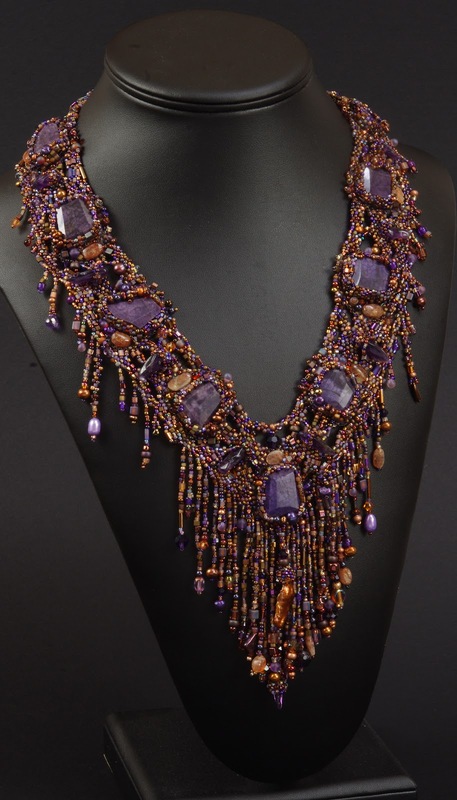 I am so totally blown away by this necklace! I loved reading about your journey in making it and I thoroughly enjoyed the story of your vision of the woman wearing it. The fringe is fabulous and the palette is mesmerizing. It was a pleasure to read this post and to view this work of art! What an amazing piece! The copper and purples are gorgeous. 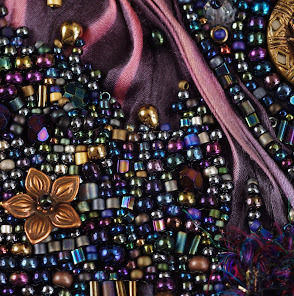 Your combo of freefrorm and bead embroidery really inspires me. Thank for the great creation story. Nancy, that is gorgeous and I would love a chance to win the soup. Thanks for having the giveaway! Your necklace, like everything else you make is beautiful and I love the colours you used. Beautiful!! Love all the fringe and the colors you've chosen. Love the story that goes with the piece and the colors you mixed are absolutely beautiful. You are very creative. Happy beading. Beautiful! I enjoyed hearing about the woman in the studio with you. Listen to the beads! As always a spectacular job ... Congratulations!!! Wow, Nancy! Your talent and skill just amaze me. Sucb a beautiful job, and what a wonderful depiction of the woman! Love the necklace. Wonderful design, great stones and fringe. You are an artist !!!! Oh Nancy! How do you do this? All of your work is drop-dead beautiful and has so much to see! 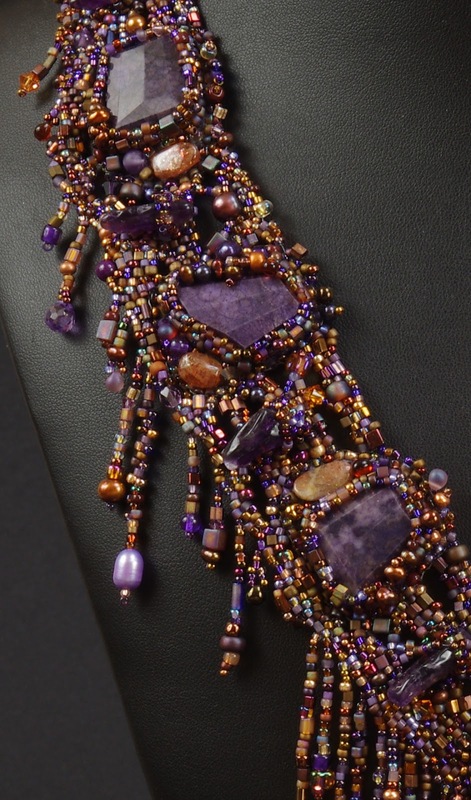 I love the colors and the variety of beads and the shape. In short, all of it. Lovely. I'd love to win your leftover soup!! Your necklace is absolutely stunning! I love the asymmetrical symmetry of it and the colors are beautiful. I am so sorry I was unable to share your generosity with everyone. I love this piece and I can totally see her! This is a totally magnificent piece. I just discovered the Facebook group, I don't even know how to comment there, but I am so glad I found your necklace, it is stunning. Very inspiring. felicidades por esa pieza tan maravillosa.. 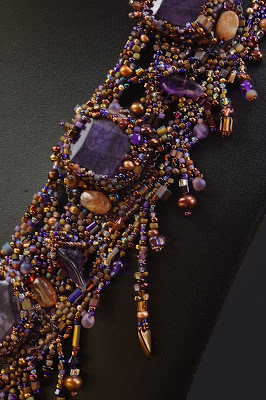 I have been away from my blog to bead for months, and I missed this post of yours. I was so pleased to find it today and read about your beautiful necklace. You have such a beautiful feel for bead soup and for freeform work Nancy. I love your random fringes as well. Just absolutely gorgeous my friend. Sorry to be so tardy in saying so!!! I’m part of the bead soup party. Looking forward to the reveals. I'm now following you. I have a new blog. Please consider following my jewelry blog. Thanks. to say what an absolutely stunning design. And, thank you for visiting as well. Nancy, back around the late 1980's or into 1990's I was into jewelry making, even took a class on jewelry repair. If the equipment hadn't been so expensive I would have gone into jewelry repair and later designing and creating my own jewelry (still want to in fact). During that time I collected Lapidary Journal magazines and spent hours looking at all the awesome jewelry of amazing handmade jewelry. This piece you created here is on the level of those I remember seeing in those magazines and others. Girl, you should be proud! It is absolutely gorgeous!